A hot spot is a small region within an explosive bulk at which chemical activity occurs preferentially, in advance of its surroundings, when the system is ignited. Chemical reactions within the hot spot accelerate rapidly to provoke a localized explosion from which a combustion wave can propagate outwards. If the explosive is suitably preconditioned, the localized explosion may be strong enough to initiate a detonation. 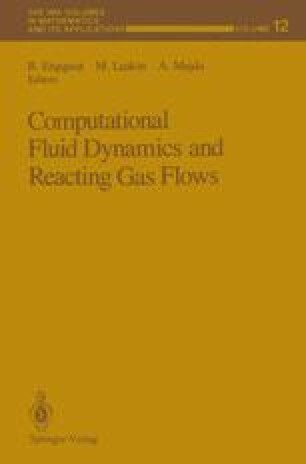 This study describes the dynamics of such a process, up to the instant just prior to the appearance of a reaction-induced blast wave at the edge of the hot spot. The birth of the blast wave is preceeded, in sequence, by a localized thermal runaway, the growth of a rapidly shrinking core of intense reaction at the runaway site, and the expansion of this core (without diminution of density) into a spatially homogeneous kernel of hot, pressurized, burnt material. The analysis combines asymptotics with numerics, and is based on a one-step Arrhenius model of the combustion process.